Sets & reps... - these are the most common words that you are going to hear in the Gym. What are reps and what are sets? The word rep is a short for repetition and one rep is one complete movements of a particular excersise. For example in this picture I am doing flat bench press, that's the exercise, yes, yes - not FAT bench press - FLAT bench press and stop looking at my belly. ok so the movements that I am doing are... reps. For example I do 10 reps till I can't life no more, then I take a rest and then I do the whole thing again, and then I take another rest and I do the whole thing again. So we are talking about 3 sets x 10 reps. OK? So Question #1 that I was always asked in the gym was - 'how many reps?'. If you want strength then go for low number of reps - say 3-6. I am going for the mass - as I explained - I want to be big and 'strong'... - so I am doing 10 reps. I select the weight such that I can do 10 reps for each and every set. I have a spotter such that in case I can't finish - the spotter helps me a little bit so I can squeeze a little bit more. 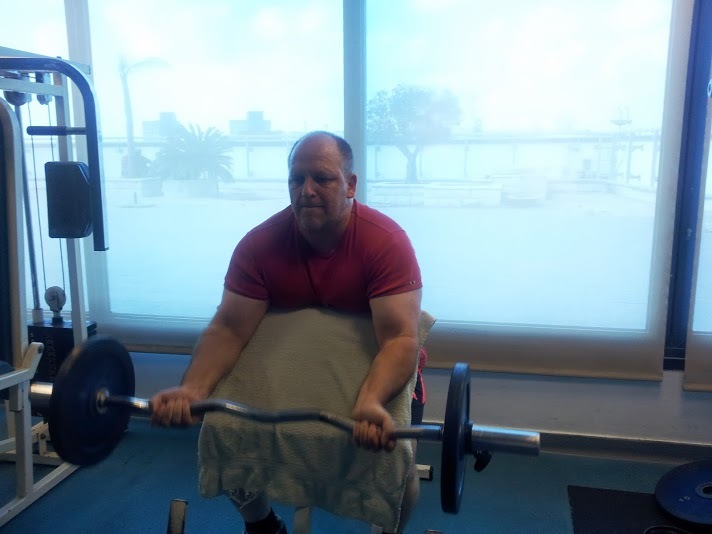 Also the spotter is for safety - imagine what happens when you want to lift the barbell but you are exhausted... - it happend to me 25 years ago when I worked out in the Gym alone - there was no one there to spot me and I had to roll the heavy barbell over my chest to get rid of it. I am on the low side here - I do 3 high intensity sets per muscle group and then I move on. In 30-60 minutes I am out of the Gym and on with my life. Now there are many body builders, and I mean champion body builders that are exhausting their body with a system of 20 sets... - that's too much for me, I am not here to bloat my muscles out of proportion and I don't have time to spend in the Gym. I come to the Gym and I know that within an hour at most I am in the shower and I know I can have 2-3 such sessions per week and my body won't be depleted. OK, one last picture - barbell curl - Actually I still have those muscles beneath the fat - don't you agree?